The term projection is widely used and so it is a complex word to unpack, but it is key to understanding mechanical media, as well as our own bodies and minds as potential media. There are four broad subjects in which this term is often used today, and which can be readily understood. This is certainly not a complete look at the term, but at its popular uses today. To start simply, projection is often associated with the human voice. In any singer’s or actor’s life, the word projection is of vital importance: the voice must be used in such a way that it attains full capacity of the physical area in which it is situated, whether the audience of the voice is in a theater, listening to an opera or a dramatic monologue, and outside of entertainment, a soldier understanding his drill sergeant. Further regarding the human body, projection is often associated with psychology, namely, the act of attributing one’s own behaviors or traits to another person. This mediates the other person in terms of the known self. The two uses of the term projection that are apart from the human body still have to do with a relocating and/or resizing of the original. The first is associated with maps and globes, though it can also be related to graphs, charts, etc. Maps take piece by piece of information and assign it to a comprehensive size and shape for the eyes and mind to understand. The fourth instance of projection moves in the opposite direction from maps, instead of making the information smaller for the mind to be able to grasp, making it larger to enhance the experience of the media. This is in movie theaters, where a 16mm or 35mm strip of film is run through a machine that then replaces it, by way of reflected light through a lens, with a much larger image for the audience to see, on the other side of the projector. Important to keep in mind is that there is a human being running the film through the machine, either winding it by hand or changing slides, or by being in control of the mechanism itself. In every case, the human body is an important medium at play, by either being the origin of the projection itself, or by mingling with an apparatus that results in a projection. Projection of the voice follows one of the word’s primary definitions: “To throw, cast, or shoot forwards or onwards. To cause (sound, the voice) to travel or to be audible at a distance” (OED). Dawson Freer condemns the technique, saying, “the endeavor to do this is responsible for much bad singing. The “shooting” is done by hammering the breath against the long-suffering vocal cords instead of bringing notes to birth and sustaining them by steady breath pressure.”1 According to his definition, there is a specific technique that allows the voice to attain the quality of “projection,” though it is not universally condemned, and the technique is not agreed upon. In some cases, the technique is considered either natural to the body or unnatural because of cultural impediments, thus requiring “mind-training” to obtain it, for instance in Rose’s comparison of Italian and English operatic singers.2 Also in acting the projection of the voice is praised, interestingly with regard to technological innovation: “Many in the audience couldn’t understand the French language, so she had to rely on the immense beauty and power of her voice to fill the theatres. It was not yet an age of microphones and mechanical amplifications: the actor had to project!”3 Thus, before McLuhan’s “extensions” of the body by mechanical media had been made,4 the skill with which she executed the medium of her body held power, in a way that is not the same now as it was in that time. The Oxford English Dictionary has two classifications for the verb tense of projection,6 “project.”7 The first is “senses relating to mental operations,” and the second is “senses relating to physical operations, and extended and derived uses,” which makes this a tricky term when considering what a “media keyword” is. Although most people assume that thought and mental process are before mediation, “projection” assumes that the human mind is a medium, through which behavior and meaning can be drawn out, or in the case of psychology, distorted. Theodor Lipps (1815-1914) conceived of its original psychological use, when describing what he called “empathy,” where “a person appreciates another person’s reaction by a projection of the self onto the other.”8 Anna Freud (1895-1982) expanded on this use of the term, and on her father Sigmund Freud’s terms, the unconscious and conscious, when explaining mental defensive mechanisms in children, closely related to repression, but keeping a similar meaning to the former, of “projecting of one’s own feeling into another.”9 This mental projection is also closely associated with physical appearances and connections; physical similarities enable one to project certain qualities that belong to someone else onto someone with a similar physical appearance. This calls for a deeper look at the human body itself, not only a vehicle for vocal projection, but for psychological defense mechanisms as well. The body, the voice, and the mind are all projectable materials, or can be projected upon. Though the psychological meaning of “projection” often relates the mental actions of one person to the behavior of another, Adrian C. Moulyn offers an insightful statement on the relationship of man’s ego in relation to machines as well as to his own species: “Man in constructing machines, projects his own purposive behavior onto them. Machines are teleological entities because they are the reification of man’s purpose-striving.”10 From this, it is possible to gather that machines, and mechanical media, are closely related to the mental capacities of man. This will come to the foreground again in discussing projection for film. Maps, globes, graphs, etc, are a means of absorbing the big picture when all of the information that makes them up is too much to comprehend. The term used to connect the original source of information to the graspable product is “projection.” The OED describes this branch of projection: “To represent (the earth, sky, etc.) on a plane surface by means of a geometrical or other projection. Formerly also: to make (a map) by projection. To draw straight lines or rays from a fixed point through every point of (a given figure) so that they intersect a surface and describe on it a new figure, each point of which corresponds to a point of the original… Hence more generally: to represent or delineate (a figure) on a surface according to a particular system of correspondence between its points and the points of the surface; to perform an analogous operation on (a figure or other object) in a space of different dimension.” Similarly to the conceptions of projections regarding mental or vocal techniques, the term offers a remediation of the original to a size, shape, volume, or area that makes it more fully accessible to man, by means of a specific trajectory. Because of this, projection, especially in maps, requires precision on the part of the person conceiving the trajectory. In Botley’s article, as well as Deetz and Adam’s, the reorienting of certain points and formulas is shown as necessary to the accuracy of the projections, for there is no purpose to the maps with a distortion or lack of truth in the images.12 However, even as the projection of these maps is based in hard math, the accuracy of the image is constantly evolving, according to new technological media, software, etc, which draws sharp contrast against the hand-drawn but imaginatively mediated medieval maps.13 Is a map, then, something with which to comprehend a basic picture of a physical location, to see where a specific person, or self, is, or to know a scientifically precise point in space? Where does the importance fall? Has that importance changed as the mediation of maps has evolved into more of math than idea? Finally, there is the projection of a film, or slides, or a digital image, onto a screen, or in the words of the OED, “To throw (light or shadow) on to a surface or into space; to cause (light or shade) to appear on a surface. To cause (an image or representation of an object) to form on a surface (originally esp. the retina) as a result of action elsewhere; (in later use) spec. to cause (the image on a film, slide, etc.) to appear on a screen for viewing….To cause the image on (a photograph, film, or slide) to become visible on a screen.” In a way converse to a map projection, the projection of a frame of film turns a small, or condensed, piece of information (35mm or 16mm) into the size of the screen on which it is visible. This also depends on the precision with which the projectionist chooses to handle the film and the projector. The correct lens [link] for the aspect ratio must be used, the dowser must be opened at the right time to allow in light, without letting the film melt or letting the audience see the extraneous beginnings and ends of the film. In preparing the film, it is vital to remove dust without damaging the film, and to repair bad splices so that the film does not get caught in the projector. 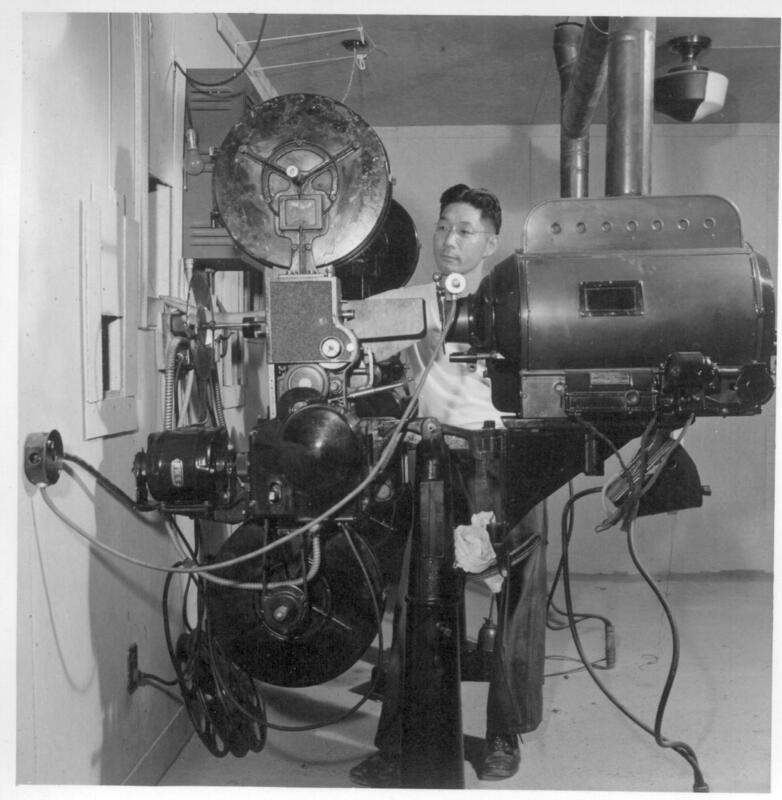 In any case, the role of the projectionist is key to the projection process of a film, as much so as the projector itself. The mechanism is at the disposal of the human body that tells it what to do, but only to a certain extent. The body and the machine act together, intertwine, in a way, so that each is dependent on the other. This idea rests at the heart of modernism. However, the projection of a film is surrounded by other traditions that are a mediation of a certain experience that is expected when going to see a film that is not a part of the mechanical process of projecting film itself.15 Film theorists, such as Laura Mulvey, in her groundbreaking essay “Visual Pleasure and Narrative Cinema” connects the experience of sitting in an audience, watching a projected film, to the mental action of projection as well, specifically, that the audience identifies with the “male protagonist” as a more perfect version of the self, projecting its own qualities onto the protagonist. The woman within the film becomes the object that is gazed upon, a sexual object, but not identified with, by the audience, in the way that the protagonist is.16 This leaves the term projection in a dense cloud, with regard to its causes. Does one form of projection incite the other, or is the spectacle of the human body just enough to trigger it? There may be multiple layers to the meaning of projection that future definitions must peel away to reveal the whole. These are certainly not the only avenues in which the term “projection” can be explored. In particular, it may be of interest, as well as importance, to mention the work of poet Charles Olsen. In Projective Verse, he defines postmodern poetry in a way that not only throws off old forms, rhyme, meter, etc, but old notions of what poetry was supposed or presumed to do in the mind of the reader. Olson states, “A poem is energy transferred from where the poet got it (he will have some several causations) by way of the poem itself to, all the way over to, the reader. Okay. Then the poem itself must, at all points, be a high-energy construct and, at all points, an energy-discharge.”18 Following this use of projection as a concept, which conforms almost easily to the OED definition, how is this anything like those uses of projection by the voice, the mind, the body, or of the film mechanism? It is a relocation of energy and/or information, it seems, that drives the varied uses of the word projection. Poetry is an interesting medium to choose in which to illustrate the possibilities of projection, but it works, and well, and is a reminder not to cut off any media keyword from pushing its limits, connecting itself to other, further concepts, and ever-evolving meanings. 1. Freer, Dawson. “’Projecting’ the Voice” The Musical Times, Vol. 100, No. 1395 (May, 1959), p. 272.
. 2. Rose, Arnold. “The Italian Method and the English Singer,” The Musical Times, Vol. 96, No. 1354 (Dec., 1955), pp. 637-638. 3. Lewis, Robert M. “Voice Training through Singing” Educational Theatre Journal, Vol. 14, No. 1, An Issue Devoted to Acting and Directing (Mar., 1962), pp. 59-63. Page 60. 4. McLuhan, Marshall. Understanding Media: The Extensions of Man. Cambridge: Massachusetts Institute of Technology, 1994. 6. “Projection, n.” Oxford English Dictionary. Dec. 2007. 7. “Project, v.” Oxford English Dictionary. Dec. 2007. 8. “Lipps, Theodor.” Encyclopædia Britannica. 2008. Encyclopædia Britannica Online. 29 Jan. 2008. 9. “Freud, Anna.” Encyclopædia Britannica. 2008. Encyclopædia Britannica Online. 29 Jan. 2008. 10. Moulyn, Adrian C., “Purposeful and Non-Purposeful Behavior,” Philosophy of Science, Vol. 18, No. 2 (Apr., 1951), p. 154. 11. Freud, Anna. The Conscious and the Unconscious. 12. Adams, Oscar S., Deetz, Charles H., “Review: Map Projection,” Reviewed Works: “Elements of Map Projection, with Applications to Map and Chart Construction,” “Flatland: Not a Romance But a Necessary Expedient by O. S. Adams” Geographical Review, Vol. 25, No. 3 (Jul., 1935), pp. 523-524. Botley, F. V. “A New Approach to World Distribution Maps,” The Geographical Journal, Vol. 117, No. 2 (Jun., 1951), pp. 215-217. 13. Tobler, W. R. “Medieval Distortions: The Projections of Ancient Maps,”Annals of the Association of American Geographers, Vol. 56, No. 2 (Jun., 1966), pp. 351-360. pp.351-352. 15. “Points and Precautions on Projection,” The Coordinator, Vol. 4, No. 1 (Sep., 1955), pp. 3-4. 16. Mulvey, Laura. “Visual Pleasure and Narrative Cinema.” Movies and Methods, Vol.2, Ed. Bill Nichols. pp. 303-314. p. 310 cited. 17. Image of a man next to a projector. 18. Olson, Charles. Projective Verse. Totem Press, 1959. Adams, Oscar S., Deetz, Charles H., “Review: Map Projection,” Reviewed Works: “Elements of Map Projection, with Applications to Map and Chart Construction,” “Flatland: Not a Romance But a Necessary Expedient by O. S. Adams” Geographical Review, Vol. 25, No. 3 (Jul., 1935), pp. 523-524. Botley, F. V. “A New Approach to World Distribution Maps,”	The Geographical Journal, Vol. 117, No. 2 (Jun., 1951), pp. 215-217. Freer, Dawson. ” ‘Projecting’ the Voice” The Musical Times, Vol. 100, No. 1395 (May, 1959), p. 272. Lewis, Robert M. “Voice Training through Singing” Educational Theatre Journal, Vol. 14, No. 1, An Issue Devoted to Acting and Directing (Mar., 1962), pp. 59-63. McLuhan, Marshall. Understanding Media: The Extensions of Man. Cambridge: Massachusetts Institute of Technology, 1994. Moulyn, Adrian C., “Purposeful and Non-Purposeful Behavior,” Philosophy of Science, Vol. 18, No. 2 (Apr., 1951), p. 154. Rose, Arnold. “The Italian Method and the English Singer,” The Musical Times, Vol. 96, No. 1354 (Dec., 1955), pp. 637-638. Tobler, W. R. “Medieval Distortions: The Projections of Ancient Maps,” Annals of the Association of American Geographers, Vol. 56, No. 2 (Jun., 1966), pp. 351-360. Tobler, Waldo R. “Projection Pitfalls,” Annals of the Association of American Geographers, Vol. 50, No. 1 (Mar., 1960), p. 58. “Freud, Anna.” Encyclopædia Britannica. 2008. Encyclopædia Britannica Online. 29 Jan. 2008 . “Lipps, Theodor.” Encyclopædia Britannica. 2008. Encyclopædia Britannica Online. 29 Jan. 2008 . Mulvey, Laura. “Visual Pleasure and Narrative Cinema.” Movies and Methods, Vol.2, Ed. Bill Nichols. pp. 303-314. Olson, Charles. Projective Verse. Totem Press, 1959. “Points and Precautions on Projection,” The Coordinator, Vol. 4, No. 1 (Sep., 1955), pp. 3-4. “Projection, n.” Oxford English Dictionary. Dec. 2007. “Project, v.” Oxford English Dictionary. Dec. 2007.